Foreign immigration largely contributed to Spain's impressive employment growth over the last decade and above all during the last five years. Interestingly, according to the existing empirical evidence, this phenomenon did not determine a reduction in the employment opportunities for the natives and did not exert downward pressures on their wages. This study analyses the implications of the recent huge increase in immigration flows from the New Member States and the Candidate Countries for the Spanish labour market. 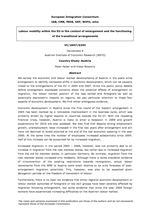 We first present the main trends in immigrants' inflows to Spain, together with their demographic characteristics and geographic concentration, within the current institutional framework regulating immigrants' residence. By using a recent survey representative of the immigrant population in working age, we discuss then the skill profile of nationals from NMS-10 and NMS-2 and we compare their labour market performance and occupational status in Spain and in their country of origin. We show that nationals from both NSM-10 and NMS-2 improve their labour market situation in Spain as compared to the one in their sending countries, in terms of higher employment rates. NMS-2 nationals, though, experience greater downward occupational mobility than NMS-10, given their lower skill levels. Men from NMS-2 in particular, are largely reallocated to the construction sector; women are almost entirely reallocated to the services sector but they experience relatively larger downward occupational mobility since their concentration in elementary occupations is higher.